Deadpool strikes a pose with this Marvel Now Super Deadpool ARTFX Statue! 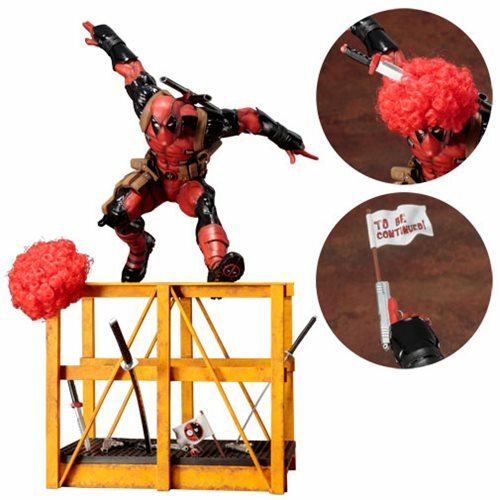 As he sneaks atop a warehouse fixture, Deadpool is ready to fight and prank all at once with his numerous accessories. Choose from an arsenal of weapons and accessories to customize his environment or arm him. Let the prankster mercenary take over your home or office with this Deadpool Marvel Now Super Deadpool ARTFX Statue. This 1:6 scale statue measures 17-inches tall and comes packaged in a closed box. 2x Katana swords. Ages 14 and up.